Gambling advertising has increased rapidly over the past decade. While smartphones, apps and social media have multiplied the marketing possibilities, a High Court decision in 2008 also played a major part in the dramatic increase in gambling advertising. The effect of the ruling was to allow bookmakers to offer bets anywhere in Australia. The ruling also made it clear that states and territories were unlikely to be permitted to ban advertising from other parts of the country. The states and territories with bans, including Victoria, amended their legislation to remove them. The High Court case and subsequent ban removal resulted in a significant rise in the number of gambling companies operating across Australia, and a highly competitive market. According to the Standard Media Index, the gambling industry spent $253.2 million on advertising in Australia in 2017, up from $89.7 million in 2011. This excludes sponsorships and in-program content, such as during live sport broadcasts. Mass media pokies advertising is banned in Victoria. However, there is rising community concern about the proliferation of sports betting advertising, particularly its effect on young people. In Australia, advertisements for betting products are not permitted during TV programs classified G or lower from 6 to 8.30 am and 4 to 7 pm, or in programs directed at children between 5 am and 8.30 pm. Until 2018, these restrictions excluded sport broadcasts. On 30 March 2018, bans on gambling advertising during broadcasts of live sport were introduced between 5 am and 8.30 pm. See the Australian Communications and Media Authority website for more on the new gambling advertising rules during live sports. On 28 September 2018, new complementary rules were also implemented to restrict gambling advertising during online streaming of live sport between 5 am and 8.30 pm. Research findings support community and political concern about how marketing may influence attitudes towards gambling. children can name four gambling brands or more. The 2016 Foundation-funded study Child and parent recall of gambling sponsorship in Australian sport collected data from children and parents at community sporting venues in New South Wales and Victoria. Three-quarters of 8- to 16-year-olds interviewed could name at least one gambling brand, and one-quarter could name four or more. The children interviewed also perceived that some forms of marketing were more influential than others, in particular, advertisements featuring celebrities. Funny videos that are not easily recognisable as advertising can also have a strong impact on children. Another 2016 study reported that 75 per cent of 8- to 16-year-olds thought gambling was a normal or common part of sport. For more on this study, see ‘It's just everywhere!’ Children and parents discuss the marketing of sports wagering in Australia. Participants in these studies were able to describe incentives offered by bookmakers, such as ‘bonus bet’ offers and ‘cash back’ deals, which likely contributed to their belief that you could not lose from gambling. This perception is not limited to young people. 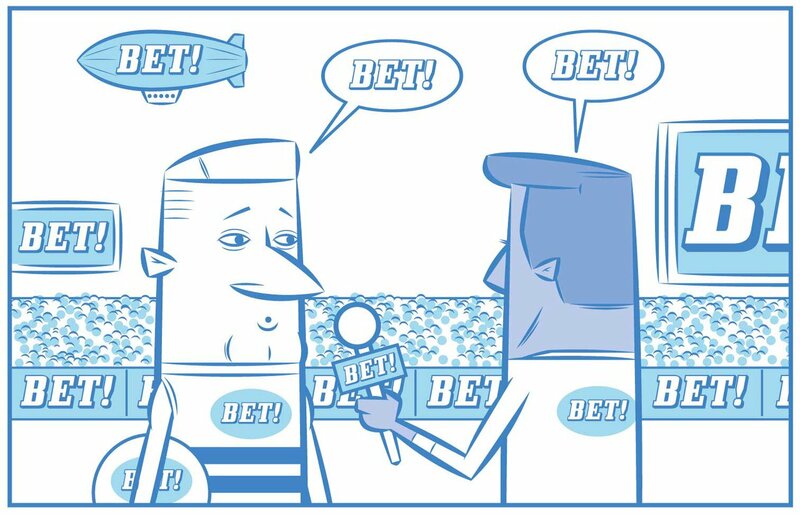 Incentives or inducements are a form of marketing used to attract new customers or to trigger further gambling. There is also evidence they can lead to people underestimating the risks they are taking. A 2018 Foundation-funded study investigated the effects of wagering marketing on vulnerable adults and found that many vulnerable bettors were heavily exposed to wagering marketing, which led them to place bigger and more frequent bets. A follow-up study looking at direct texts and emails sent by wagering operators found this direct messaging to be extremely frequent and likely to contribute to risky gambling. The Foundation’s Love the Game Sporting Club Program works with local and elite sporting clubs to counter the growing culture of gambling in sport. Our School Education Program supports secondary school communities to help young people develop informed attitudes to gambling. Find out more about our work to address the normalisation of gambling at Love the game, not the odds.